Clump #71: Bring left-behind belongings to younger daughter and clear out shoebox. I had the delightful job of bringing a clump of things to my college student daughter and taking her out to lunch today. 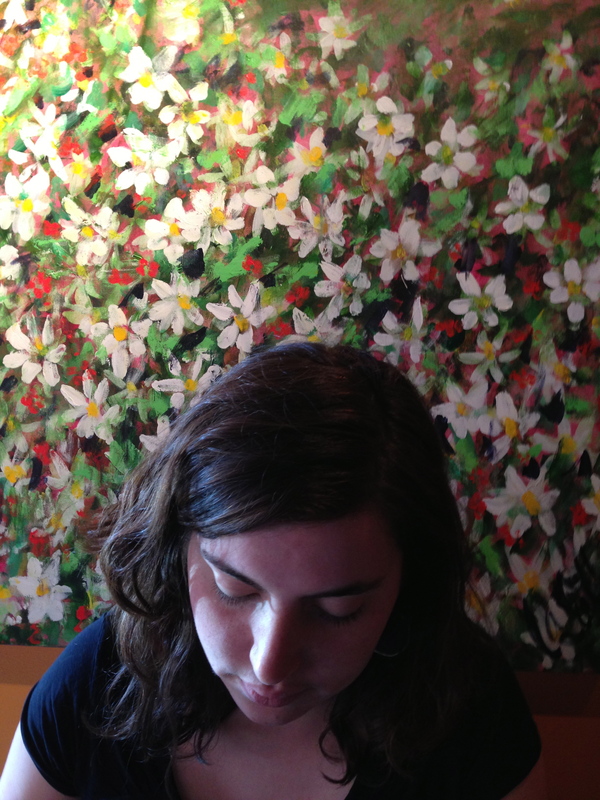 The restaurant was decorated with beautiful, energizing paintings of flowers. 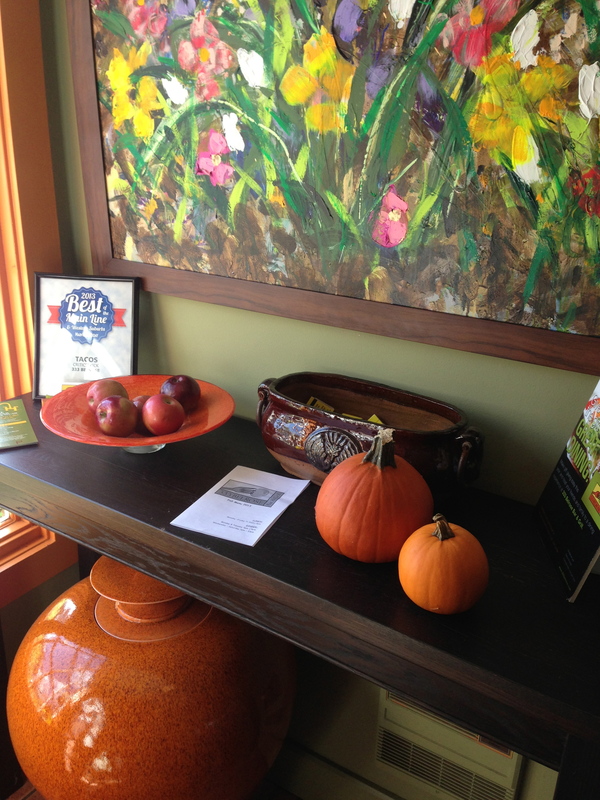 I loved this fall display with the pumpkin-like urn on the floor. Even more lovely was a short reprieve from the recent sensation of chicks leaving the nest. Heaven. But then it was back home to make another little dent in the shoe-pile remains: a shoebox that somehow became the repository of a strange assortment of objects. 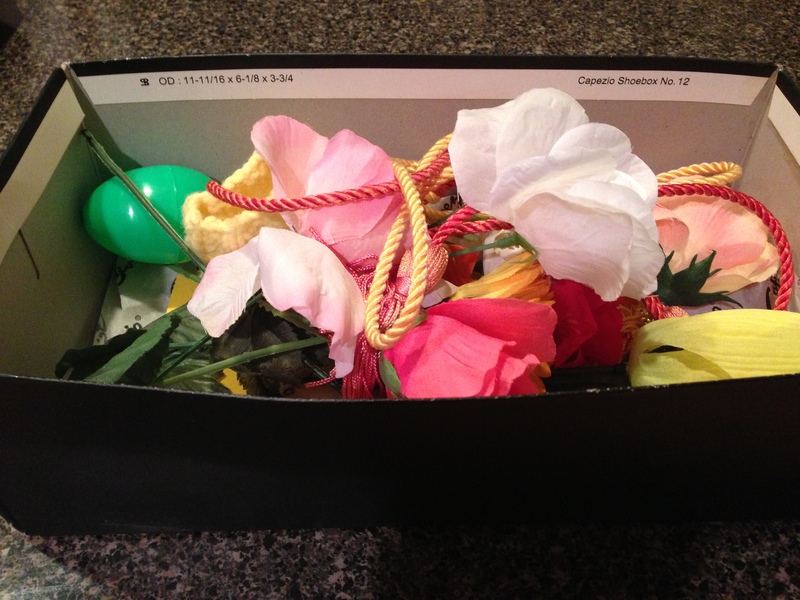 More flowers: these were from a past theater experience involving our older daughter. They will adorn the next Goodwill donation pile. 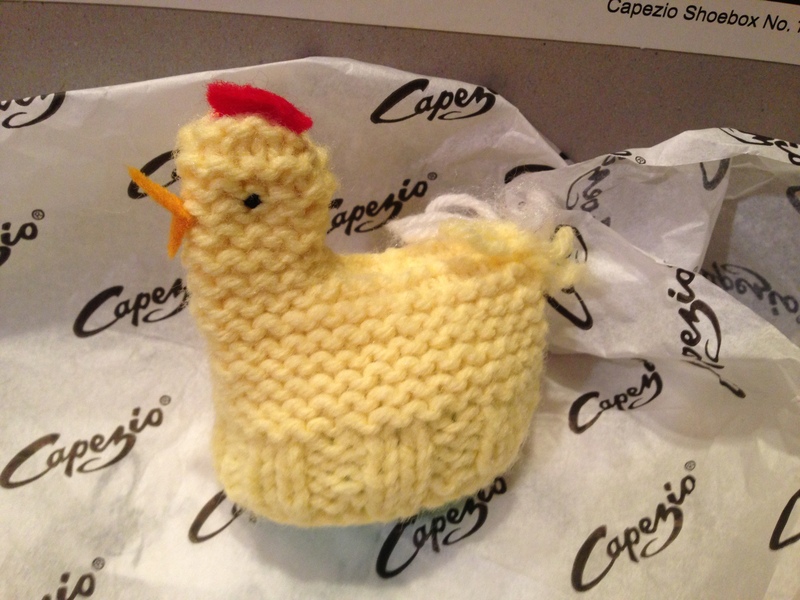 This chicken was hand-knit by the dear second wife of my husband’s father. It sits on a green plastic egg. Must keep. I put it away with other Easter stuff, to be enjoyed for years to come. I can recycle the box and my identification number from when I was on the show Let’s Make A Deal (a blast, even though I didn’t get picked to play). 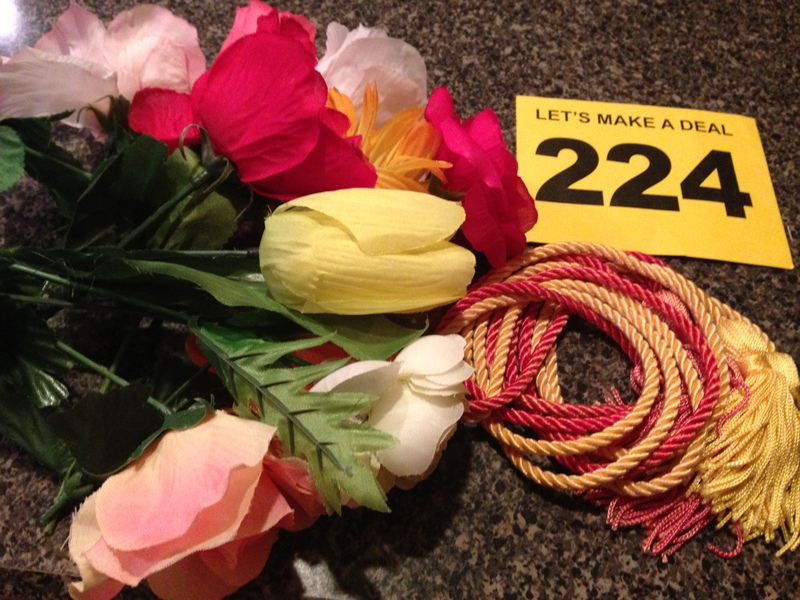 We’ll hang my husband’s academic cords on his side of the closet, where he had thought they still resided. He worked very hard for them. 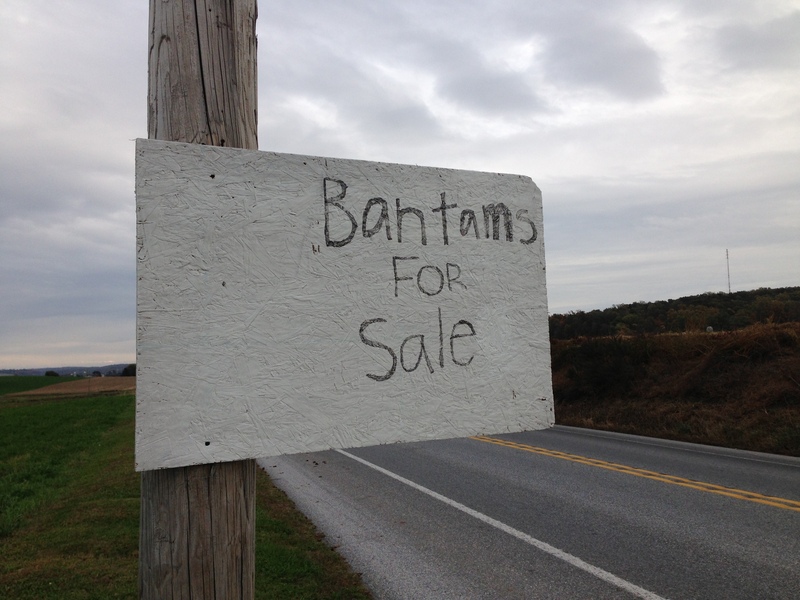 Just yesterday I had stopped to take a picture of a sign I enjoy seeing on my way to and from visiting my mom in Lancaster County, PA. 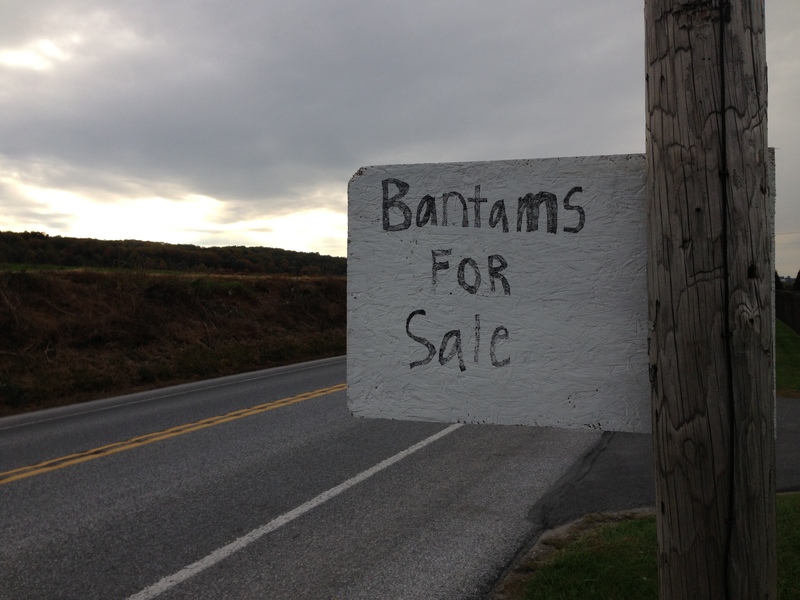 I know I’m in farm country when the roadside advertisement is for Bantams. I wanted to make sure I knew exactly what Bantams are, so I googled a definition: “Called the flower garden of the poultry world, Bantams are miniature chickens, usually one-fourth to one-fifth the size of standard varieties.” Once again, flowers and chickens. Great sentiments! I am so glad you decided to keep the knitted egg cover for Easter, and I had no idea you were Let’s Make a Deal!